It’s hard to get a proper party going in this area, with all the Facebook-trolling cops and party-pooping snitches. I say this because Slotopia, that would-be May 2nd beach party, is supposedly cancelled, after the authorities leaned on organizer Ryan Dean Magill. It’s cancelled, which is weird, since it only existed as a concept anyway. How can you ban the idea that it would be nice for a bunch of people to gather on a beach on a certain day? The cops told him he’d need a permit. For what? How can you need a permit if you don’t collect money or sell tickets? He don’t need no steenkin’ permit. If you give it a title, is that when you need a permit? What if you call it the unnamed party, then can you party? But here’s the thing. If they really want to sneak one past the cops, those freshly scrubbed Cal Poly kids might have to figure out how to be more sneaky and underhanded. Turns out the cops are on to the “Internet.” I know, who knew? Back in the 1830s, when Phil Dirx and I came of age, we learned to communicate our partying desires with secret hand gestures and furtive glances. One could communicate so much with the way one harnessed one’s oxen. (Yoke leeward=hit the Madeira behind the old oak). Take a lesson. Even the tough guys around here aren’t very sneaky. If you doubt it, type “Paso Robles x3” into YouTube and witness the spectacle of a number of young men gathered in a garage flashing unusual finger contortions while sporting a variety of “805” or “P.R.” tattoos. Some are posing, masked, with assault rifles, and, inexplicably, their video repeatedly shows the Paso Robles city seal. Not too sneaky. Not that I’d want to, but I’ll bet I could locate the house, dudes, and cars featured in that video in about 15 minutes. So, let’s take some lessons in sneakiness. The local government offices can be sneaky. Example: In May, property owners in the county, and only property owners, will be asked to “vote” on $1.1 million in new taxes for “vector control,” which sounds like a program to corral fancy Italian scooters but is actually about chemical spraying for mosquitos. I place the word vote in quotes because this is one of those votes that’s essentially rigged. This is a vote demanded under Proposition 218, known as the right to vote on taxes act. The only way it could fail is if more than 50 percent of ballots vote against it. • People who own more land get more of a vote, and the county has a very big vote. • Renters get no say, even if they’re in the path of a potential chemical bath. Still, we should fight this. This county simply doesn’t have much of a problem with mosquitoes because there isn’t enough water. The prospect of West Nile disease is being invoked to explain the call for the new bureaucracy, but there have been only a handful of cases in SLO County, and none of them fatal. In the county’s own information packet, the answer offered to the question “Why is this Measure Needed Now?” is that there were recently 140 cases in Kern County. Different county, with different problems, including a lot of recently abandoned swimming pools from foreclosed properties. Nationally, the cases of West Nile have been vastly overstated. A USA Today article from January says last year’s cases were overstated because of faulty testing kits. Even before the errors are taken out, there were only 1,370 cases in the whole country, causing 44 deaths in a population of more than 300 million people. Truly, the odds of being killed by lightning are higher than the odds of dying from West Nile, and especially not here. And if we’re going to play odds, how many chemically sensitive people will be scared, panicked, and potentially harmed, by the spraying itself? The contest, now with real prizes! I love you people (in darkened movie theaters; I’m in the row behind you, watching) but you’ve proven yourselves useless in coming up with contest ideas. So here it goes. The contest: Predict the last daily newspaper headline that will ever be written. And this time I’m offering a real, not imaginary, prize. You will win either a copy of Transgressions, a male-on-male romance novel set in 1642 England. (It features blacksmithing, religious extremism, and forbidden love. You want this.) Alternatively, you can choose The Sweet Smell of ASH in the Morning, a book described as “A twisted look at forensic mental health in Atascadero State Hospital through the ramblings of a burnt out Psychiatric Technician.” Your choice will say so much. 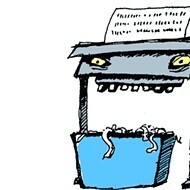 Send contest entries (anonymously is fine but I’ll need an address if you want a prize) to shredder@newtimesslo.com.